SANTA CLARA — Amid wide-reaching tensions hovering over the NFL about on-field national anthem protests, the team where everything started is trying to move the conversation beyond the current stalemate by joining forces with a group of big-city police unions. Thursday, the San Francisco 49ers and representatives of police unions from San Jose, Oakland, New York, Los Angeles, Sacramento, Long Beach and Portland will detail a broad agenda to address police-community acrimony across the country that are at the heart of the ongoing on-field protests that have far transcended the professional ranks. That agenda is highlighted by a commitment from the 49ers to bankroll the production of a series of public-service announcements to be broadcast nationally to promote better relationships between law-enforcement and residents wary, and weary, of police violence. In a joint statement, the team and the police-union coalition mentioned the collective need to improve a situation that has pitted NFL players against swaths of fans and in some cases their own management. The need to voice that sentiment is born from the fall of 2016 when then-49ers quarterback Colin Kaepernick first sat, then kneeled during the playing of the national anthem to protest the killings of unarmed black men and women at the hands of law enforcement. His gesture gained traction over the course of that season and was galvanized league-wide this year after President Trump insulted protesting players and suggested they be fired for insubordination. Kapernick is currently pursuing a collusion case against the NFL, alleging that the league has uniformly retaliated against him for his protest. Sgt. 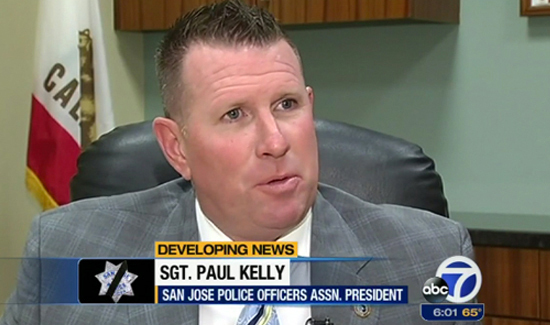 Paul Kelly, president of the San Jose Police Officers’ Association, said he and his colleagues decided to take tangible steps after hearing rhetoric but no significant action from the league. The platform being put forth by the 49ers and the police unions is a medley of semi-related causes. Besides the PSA outreach component, they are throwing their support behind either legislation or federal regulatory changes to ban armor-piercing bullets, gun silencers, and most prominently, “bump stocks” that modify legal firearms to simulate automatic weapons. The devices gained infamy after they were used by Stephen Paddock, the shooter responsible for the Las Vegas massacre on Oct. 1.